Teddy Ruxpin Online - Playskool "TeddyII"
Following the decline and eventual demise of Worlds of Wonder, the Teddy Ruxpin license was transferred to Hasbro in 1991. From 1991 to 1996, "TeddyII" would be distributed under it's Playskool banner. 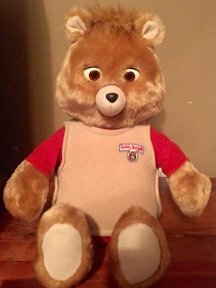 Playskool’s Teddy Ruxpin was largely a simple rebranding of the “Teddy II” model introduced in 1988 - 1990 by the fledgling Worlds of Wonder. In an effort to cut costs, WOW had redesigned Teddy to be smaller and more cost-effective to produce. While many consider him to be more “cuddly” for young children, a few compromises were made. The most obvious difference was the use of cartridge-like cassette tapes rather than the standard cassettes used in the previous models. This meant they were less susceptable to “unwinding”, but it also meant that all previously released animation cassettes were incompatible with this new Teddy. The cartridges used in the almost identical WOW version are interchangeable with the Playskool label TeddyII, however. Mechanically, Teddy II had fewer motors powering his animations. As such, Teddy’s eyes and mouth could no longer animate simultaneously. Teddy’s eyes would remain open so long as his mouth was in motion. Because of the less demanding infrastructure, the traditional C batteries that powered the original Teddy were replaced by four AA cells. Teddy himself was much smaller, thanks to no longer having to accommodate a full-sized cassette player in his back. This made him much lighter and more child-friendly in terms of portability (many children found the original Teddy’s girth unwieldy). reboot. Exclusively paperbacks, they retained original artwork and stories. To differentiate Teddy II’s cartridges from the original Teddy, a revised “World of Teddy Ruxpin” logo was created, showing Teddy’s face from the side. Retail box art for the toy encouraged buyers to look for this new logo when purchasing books and tapes. Aesthetically, Teddy II retained the “classic” outfit (red tunic with beige vest). The Playskool version appears to have used a brighter red for the tunic, and the sleeves on the Playskool unit were used as the arms and extended to the very tip of Teddy’s wrist. 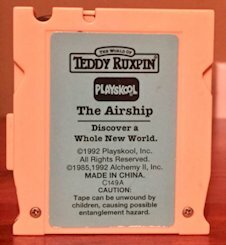 Because of the similarities, often the only way to tell the difference between the WOW and Playskool versions of Teddy II is by the logo on Teddy’s back, above the cassette deck. In lieu of the wheel used to operate the original Teddy, Teddy II featured a single button to turn him on and off. Tapes were inserted into a cartridge bay on Teddy’s lower back beneath the battery door. The battery door itself occupied the space where the original Teddy’s tape deck used to be. The WOW version of this door was spring loaded, while the Playskool version was fastened by a single, Phillips screw. Much of this design would be implemented into the subsequent Yes! Entertainment and BackPack Toys Teddy Ruxpins. Due to being vastly redesigned from his original form, Teddy II is incompatible with virtually all of the original Teddy’s accessories. Most notably, the tapes for the original Teddy will not work in Teddy II. Books can be substituted between the two models as they are virtually unchanged apart from respective colors and the move from hardcover to paperback. Because of his diminutive stature, the outfits that were available for the original Teddy will appear much too big on Teddy II. Teddy II also lacked the “auxiliary” port to pair him with prior accessories such as Grubby, the Answer Box, or the Picture Show projector. No direct accessories for the toy were produced aside from the books and tapes. The only other Playskool branded Teddy Ruxpin product was a toy phone, which children could “dial” and hear Teddy and Grubby talking to them. 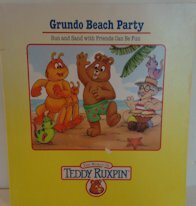 For many, this first redesigned Teddy Ruxpin was their gateway into Grundo. Unfortunately, unlike their predecessors, they haven’t withstood the test of time. The inferior design may have helped keep everyone’s favorite Illiop on store shelves for a few extra years, but with electronic toys becoming the norm as the 90’s came into their own, Teddy was a forgotten herald of that revolution. Incompatibility with all of the previous stories and accessories meant that even if you owned an original Teddy, you’d be starting from scratch with this incarnation. Because of the financial restraints on WOW and Teddy’s limited post 90’s success, this was only a fraction of the experience that anyone who grew up with the original Teddy would remember. We would not reccommend it for a child, and caution collectors to do due dilligence before purchasing, if they decide to. A fully-operational Playskool model is increasingly difficult to find, although in this case that rarity does not equal value. Unlike the WOW version, repairing these units is nearly impossible. With a limited amount of storybooks and accessories and prior and subsequent versions of Teddy on the market that are far superior in quality, the Playskool version is perhaps the least sought out by collectors. A working Playskool in mint condition in it's original box is worth approximately $50-$75. "Untested" is usually a polite way of a seller saying Teddy probably doesn't work. These can be scooped up for between $20-$30, depending on the physical quality. Add 10% for a box in good condition, or an extra few 'bucks if the talker includes some books and/or cassettes. Story & Cassette bundles will fetch around $10 in good shape. Books by themselves, as little as $2. As always, watch out for other versions' (and non-compatible) cassettes or cartridges being bundled with TeddyII. TEDDY RUXPIN, ALL RELATED CHARACTERS & INTELLECTUAL PROPERTY ARE (C) & TM ALCHEMY II, INC.